Retired to run for Governor of Guam. ^ a b Guam Election Commission. 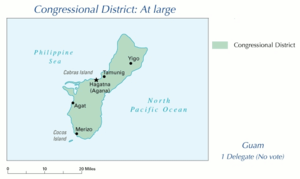 2018 Primary Election Results Hagatna, August 26, 2018. ^ Congressman Gregorio Kilili Camacho Sablan. Kilili congratulates Michael San Nicolas, new Democratic Guam Delegate, November 6, 2018.